Community security should be a top priority for any property manager. Multifamily, student and military housing communities have hundreds, sometimes thousands of residents to protect at a time, and criminals could target any community with perceived weaknesses. This is why an important aspect of a property’s security plan should be protecting unit keys. When casing a community, criminals will first consider the easiest way of gaining access to the units: using the key. Keys provide crooks with full access to private units, allowing them to steal from unsuspecting residents, or worse. – Where are the keys stored? An open pegboard is much easier to access than a locked pegboard. An electronic key control system is even more difficult maybe impossible — for criminals to thwart. – How is the staff held accountable for keys? Do they have to sign out a key or enter a PIN to get access? – Is the key management system being used correctly, or are staff members bypassing key policy? – How is the spare key handled? Is the filing cabinet locked? Who has access? A large part of security is personnel training. Leasing agents should be trained always to accompany customers on property walks. Keys should never be left in the door when touring a unit. If all staff members know they are accountable for the keys in their possession, they will be extra careful about protecting and returning keys. Criminals posing as prospective residents may try to steal the key after a unit tour. At a property with an electronic key control system, leasing agents will be more alert to this tactic. The key is signed out in their own name (PIN or Biometric reading). They know they need to return the key after the unit tour. The last thing they want to hear is their name associated with a missing key. 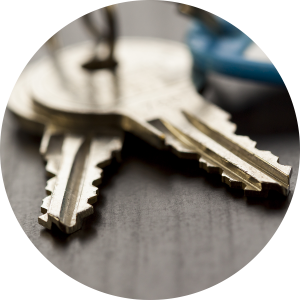 Leasing agents, maintenance personnel, and other authorized staff members need quick, reliable access to the keys. An unlocked pegboard is a tempting solution, but it is also tempting to thieves. The need for quick access needs to be weighed against the need to keep control of the keys. Missing keys create chaos for everyone. Lost keys mean lost property and lost residents. Electronic key control systems are an important part of any multifamily community’s security plan. Each staff member is held accountable for the keys they have checked out, the system is tamper-proof and locked, and management can run a live key report at any time. This discourages criminals, who will likely move on to an easier mark. For over 30 years HandyTrac has been the low-cost leader in multifamily and military housing key control; managing keys for more than 3,000,000 apartment homes throughout the country. Our cloud based systems offer instant access to archived reporting and provide the ability to manage your communities with a single login through your computer or smart phone. Contact HandyTrac today to learn more about our electronic key control systems.